Caesar on the lighter side & grilled eggplant with spinach marinara sauce. I love having the TED talks on while I’m working, they’re very inspiring. This week I found Jamie Oliver’s TED Prize talk, which was great and not just a little bit scary. The new season of Food Revolution has been on a bit of a hiatus so I’ve been checking in with the communities online. They have twitter parties and swap ideas, recipes, initiatives and most importantly, get young people involved. It’s a lot of fun. After Jamie’s talk I watched Mark Bittman on What’s Wrong With What We Eat, and Ann Cooper Talks School Lunches. I like to think I’m pretty well read when it comes to diet and exercise, but I was reeling by the time these phenomenal speakers were done. The message is pretty simple. We’re killing ourselves and it’s largely preventable. One of the things that struck me most profoundly in Jamie’s talk was that students need to leave school with the ability to cook ten basic recipes. When I went off to college, it was Mac n’ Cheese and Mr. Noodles. (The memory is giving me an MSG headache as I write this.) When I think about it, those “convenience foods” aren’t really any faster or more convenient than the meal pictured above. They’re actually more expensive, have almost none of the nutritional value and don’t leave any decent meals for the rest of the week. 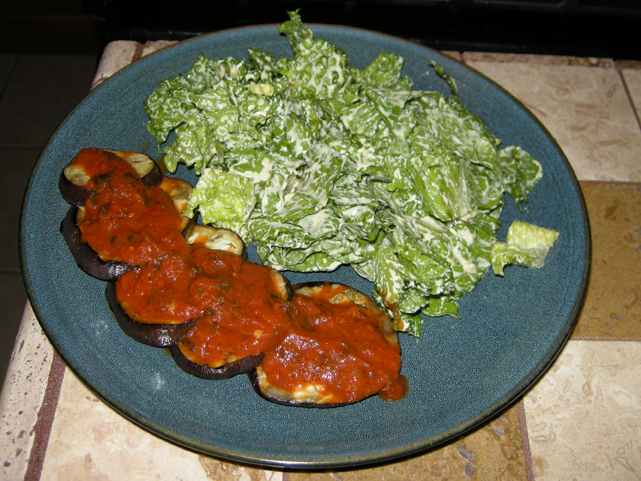 I can get at least four dinners out of the amount of delicious grilled eggplant and Caesar salad I made last night. Promises Promises is a humour site and I know nobody comes here to be frightened or lectured to about diet and exercise. Those are the two things we make fun of the most. But, I do think we could be doing more to inspire and inform. Things like Frances’s sweet potato recipes and the Facebook discussions are a good place to start, but I’m throwing my hat in and announcing that Promises Promises is officially joining the Food Revolution! The Food Revolution’s Get Cooking page has a bunch of really easy recipes for getting started. I’m going to attempt a new one each week and post about it here. I’m encouraging all of my readers to join me, and I’d love to hear about your results too. Starting today with Caesar On The Lighter Side! This salad was super easy to make and took less than ten minutes. The dressing can be thickened with a bit more yogurt or thinned out with a bit more lemon and olive oil. I saved a little bit to thicken and have on a baked potato for lunch today. It was really tasty. I’m not a fan of anchovies or crutons, which are two of the Caesar salad enthusiasts essentials, but even without them this dressing works. Lettuce gets a little soggy if you leave it in dressing too long so I’ll be serving up the last of it tonight with the Crunchy Garlic Chicken, which I think is the new recipe of the week.